Good morning friends! 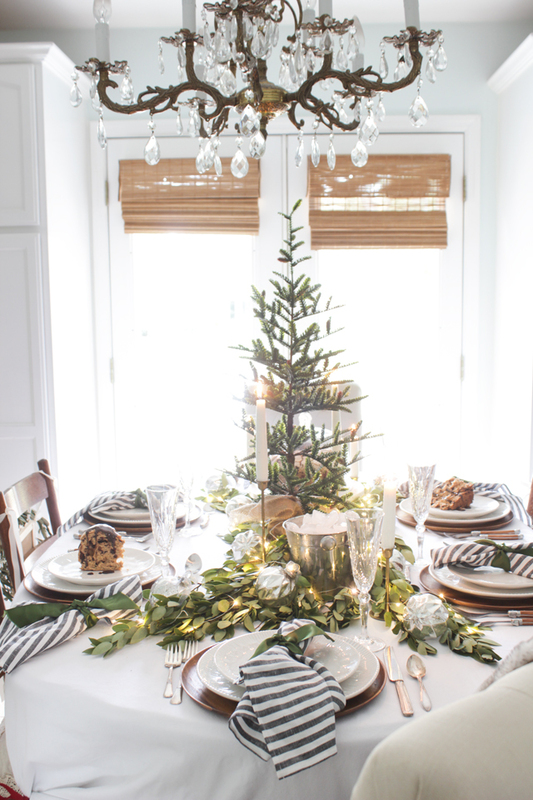 Today I’m sharing a fresh green Christmas table — my dining room table to be exact! 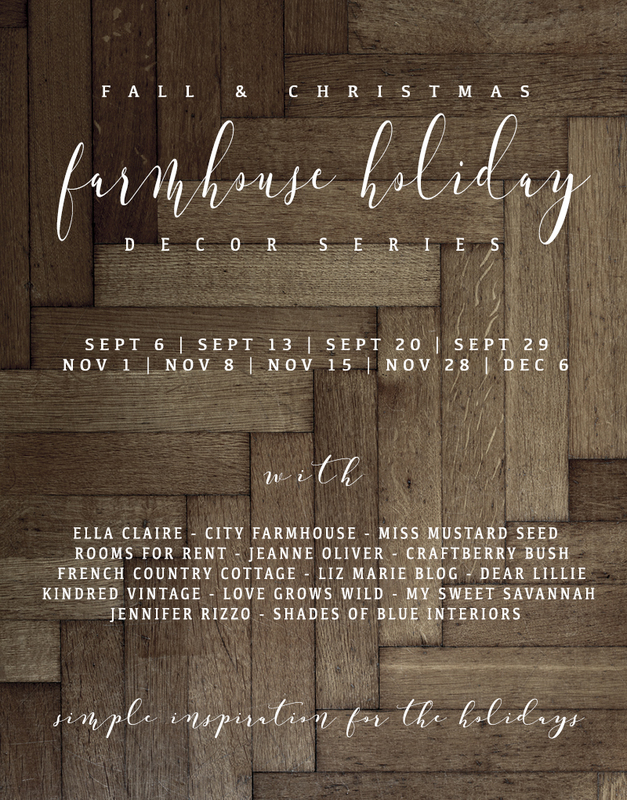 This is the 2nd week in the Christmas segment of the Farmhouse Holiday Decor Series hosted by Ella Claire Blog. 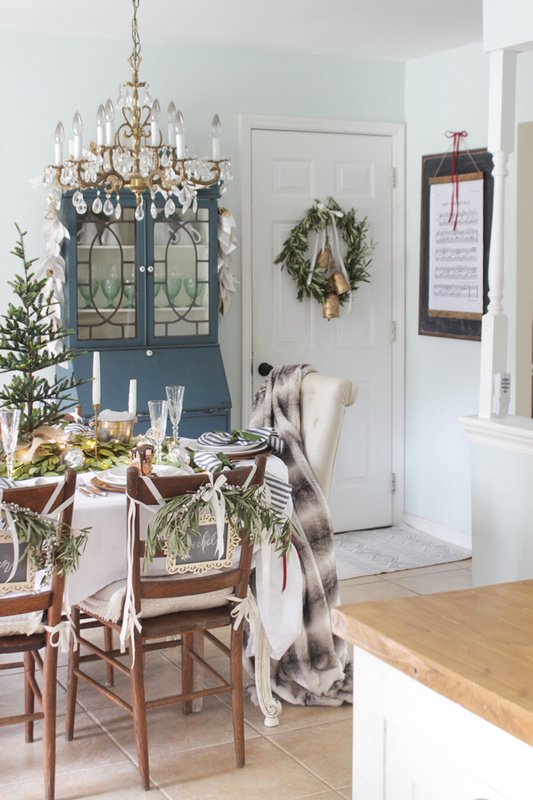 Now with that, I’m excited to share with you my dining room, decorating for Christmas, sponsored by HomeGoods! 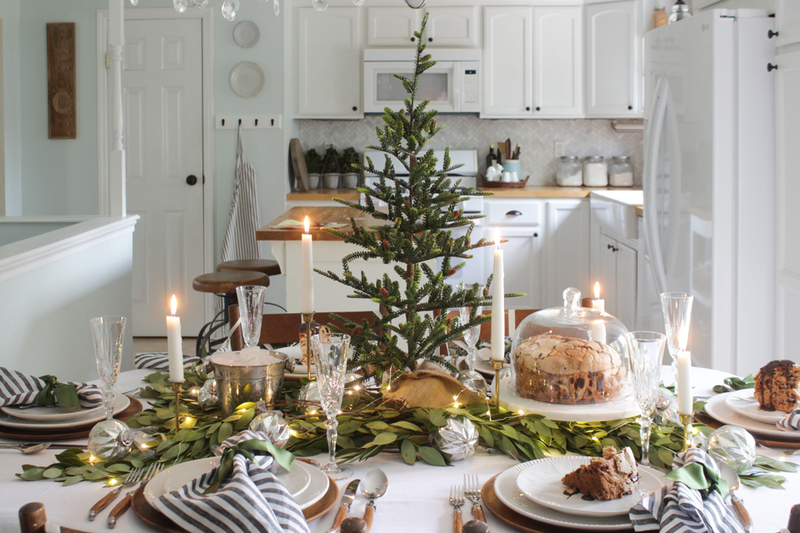 I haven’t quite nailed down my color scheme for Christmas so I opted for fresh greens (fresh bay leaf branches, and olive branches), pretty metallics, and natural woods– it’s a pretty neutral palette and one that I can add a pop or color to once I decide what direction I want to go. If you notice here, I reused the chair name signs I made last week for my Colorful Thanksgiving Tablescape, but I changed a few things up. I decided I would add a little fresh olive branch swag and some silver bells (from HomeGoods). I have been itching to get rid of the two tall back chairs I used to have at either end of the table, and thankfully, this opportunity allowed me to buy these pretty linen-type tufted dining chairs. I’m going to pick up some slipcovers for them at Ikea, but for now they are chairs that only adults sit in, so they haven’t gotten dirty so far. 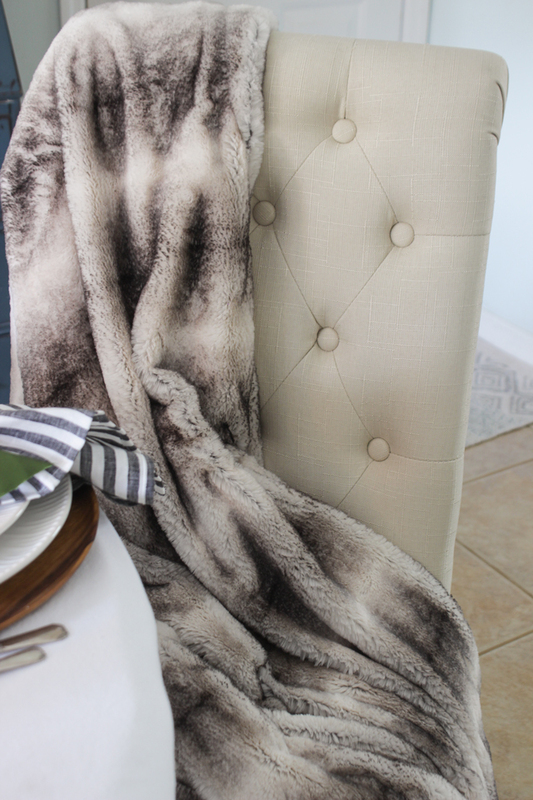 I added a SUPER soft faux fur throw on both chairs for a luxurious, wintry feel. I also got new chair cushions for the 4 wooden chairs, which are smaller than the ones I had previously from World Market, and are the PERFECT size for my chairs. They are also a lot thicker and more comfortable. 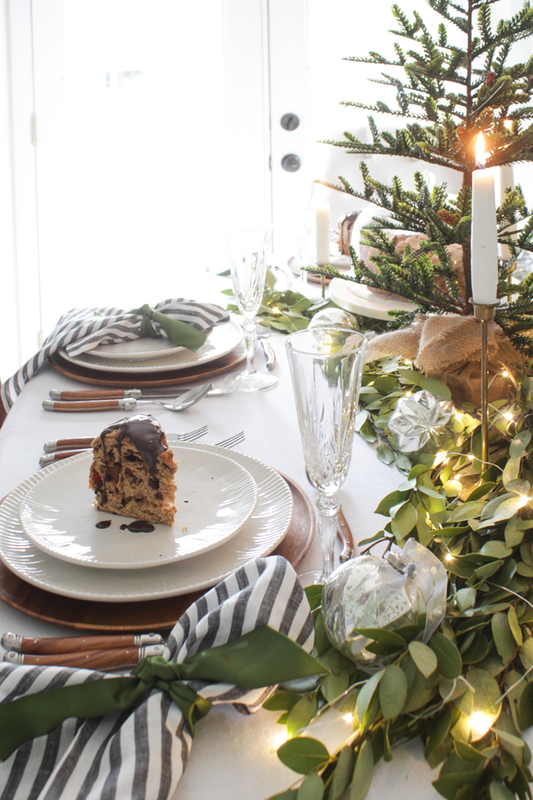 ALSO BEST NEWS EVER– HomeGoods officially has in stock for the holiday season…. panettone!! 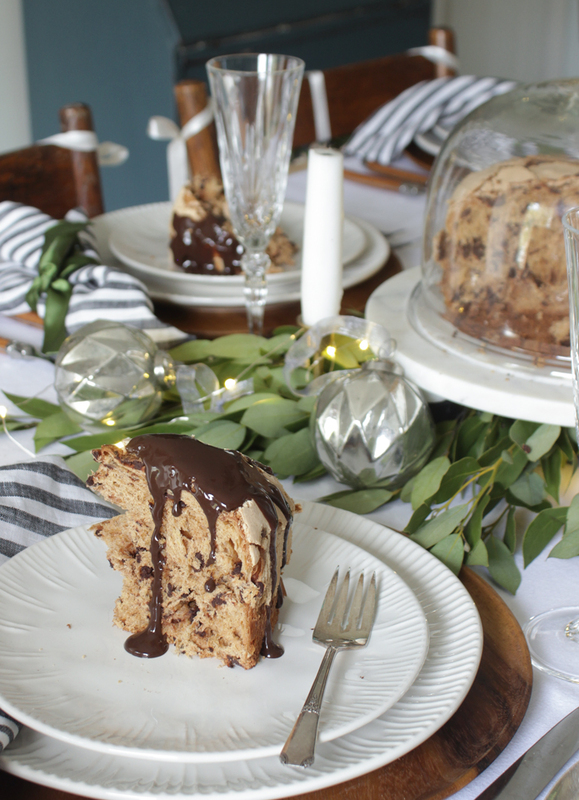 Chocolate is the only kind I like, but it has been a sort of tradition ever since I married Bruno, that we have chocolate chip Panettone on Christmas morning, so I felt it would be fun to set it out on this pretty marble dome serving dish. Drizzle some hot fudge on top… fuhgetaboudit! I wanted to mix some new with things I already had, so for each place setting I used the white birch dishes, striped napkins and wood chargers that I got from AllModern a couple months ago, french flatware from BirchLane that I got this past spring, and vintage brass candlesticks I already had. I got those pretty crystal fluted champagne glasses from HomeGoods because I honestly didn’t have anything clear and festive. We have goblets that are a couple years old but my kids have been using them on the regular lately, so I wanted something special for the holidays. I absolutely am obsessed with the fresh bay leaf branches. I got them at a floral wholesaler and they set the perfect base for the rest of the table. I placed some mercury glass ornaments (from HomeGoods) around and also ran some rice lights all through them with the battery packs sitting right at the base of the faux tree in the center (also from HG). It is simple but let’s face it– once you add lights it feels like Christmas. The nice thing about these fresh green bay leaves, is that they dry beautifully too, so I can reuse them for other things! I am in love with this table right now. I’ve had it up all weekend and I’m not getting tired of it! haha! Ok, so let’s talk about this little corner for a minute, shall we? My beautiful friend, Kristen, recently opened her shop with some original artwork and holiday posters and I ordered two right away. They arrived ON MY BIRTHDAY (last Saturday) and I couldn’t wait to find a place for them. I don’t know if this is where this Christmas hymn one will live all season long but right now it is perfect alongside my olive wreath. This wreath I made by just wrapping bunches of olive branches together with floral wire until I had a long garland and then attaching both ends together. Super simple, easier that wrapping them around a grapevine wreath in my opinion. Then I just hung some pretty bells that I found individually in the specialty ornament section of HomeGoods. My kids were SO excited when they came home and I was already done photographing because that meant they could enjoy the chocolate panettone and sparkling cider! Not exactly a healthy after-school snack, but they loved it! Below are the other stunning tablescapes and dining rooms, make sure you check them out! 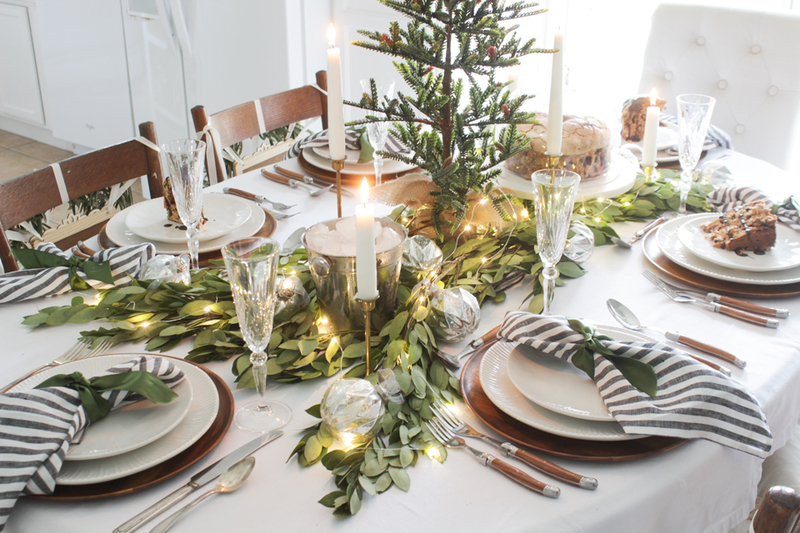 love all the greens on your table- so pretty! This looks so pretty! I love your style and your blog. I have loved all the improvements you have done on your home. Your christmas decor is so fresh and pretty. Can’t wait to see it all over the house! Love your wreath. Those bells….sigh! I love that y’all are showing your homes early! In past years, while I LOVE Christmas home tours, my house is already decorated and feel like its too late to change everything around when I’m inspired by something. I love seeing your homes while I’m planning and getting started on mine. Your home is so beautiful and find so much inspiration. Thank you!!!!! Love everything on the table, all around, beautiful! just beautiful. My favorite so far! Beautiful! Love all of the natural elements! The olive branch wreath is my favorite! Stunning yet warm and beckoning. It’s the fresh greens that say “come in”. 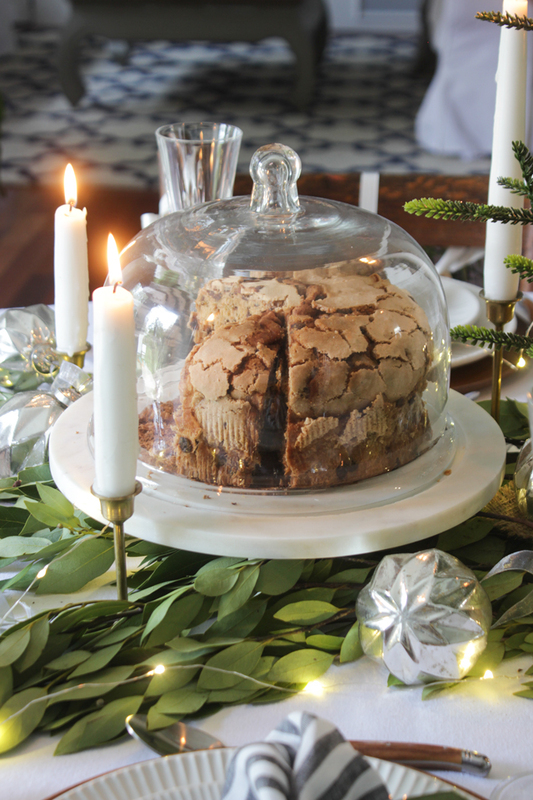 I love the bay leaves and that cake looks divine. So pretty and inspirational! I wish you were my neighbor …. I could learn so much from you. 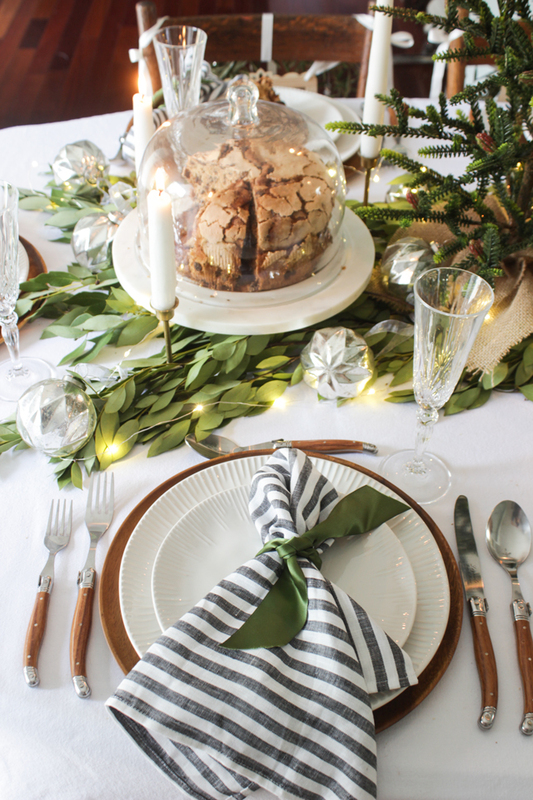 I’m loving the jingle bell swag, mercury glass ornaments and the casual style napkins. Very pretty table. You are fortunate to have access to the fresh olive greenery. 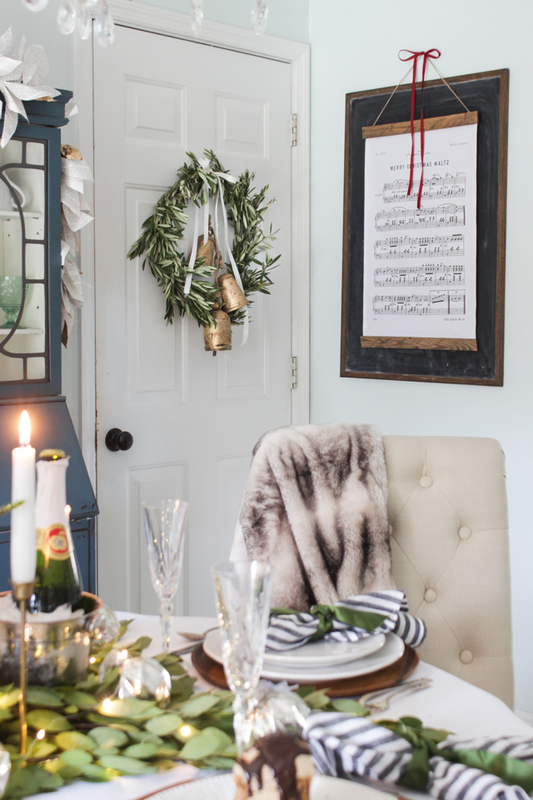 Love the wreath and bells. Beautiful room. I love the chandelier can you tell me if it is old or new? A close up photo? I love your greens! 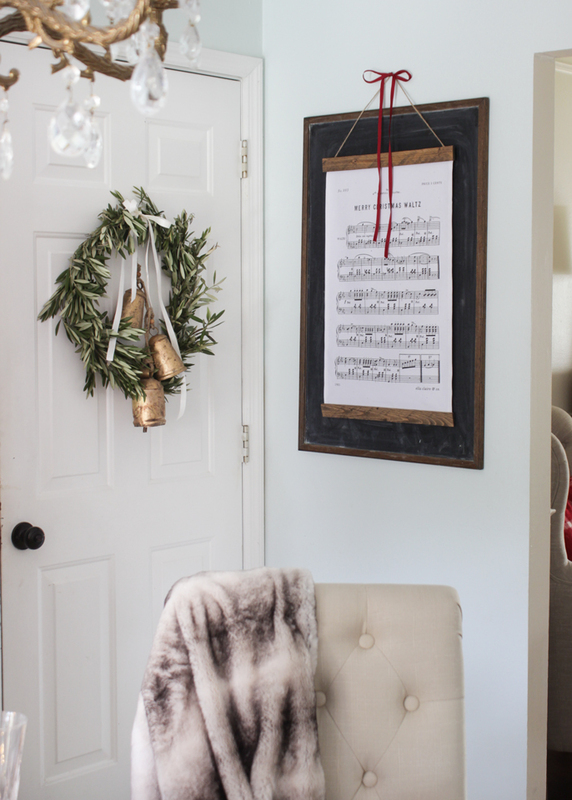 The chair signs with greens & jingle bells make me swoon! I would love to add those bells you have on your wreath to my own! Stunning!!! I’m a pinning machine! 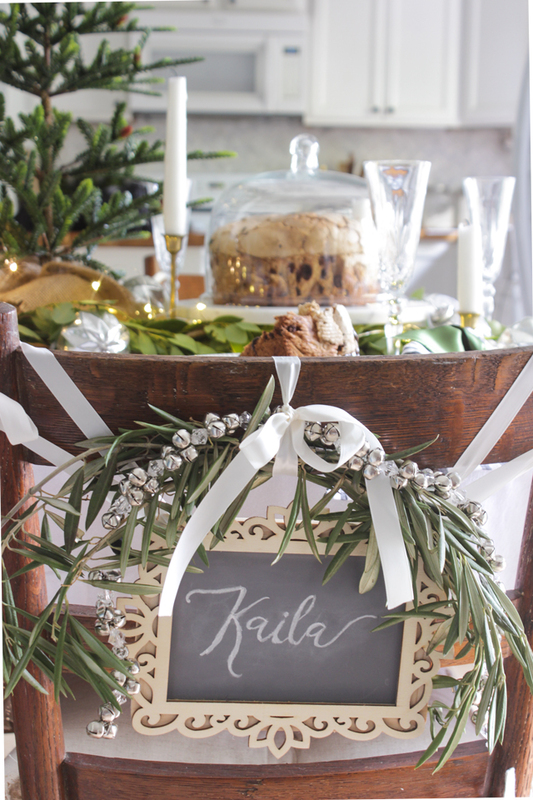 Love every little detail including the chair swags with jingle bells and name plates, the bay leaves, and olive branches….just gorgeous! Could you please share with me your resource for the floral wholesaler? 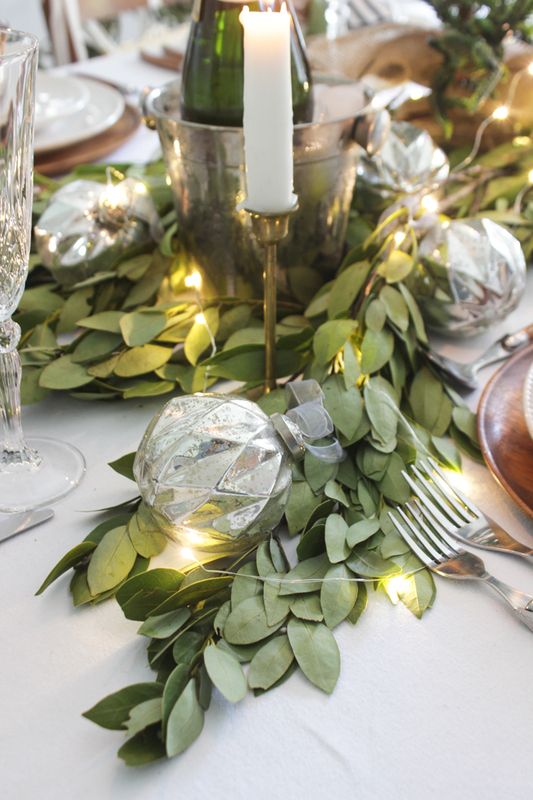 … I live in the Metro-east and would love to add a bay leaf garland to my buffet. 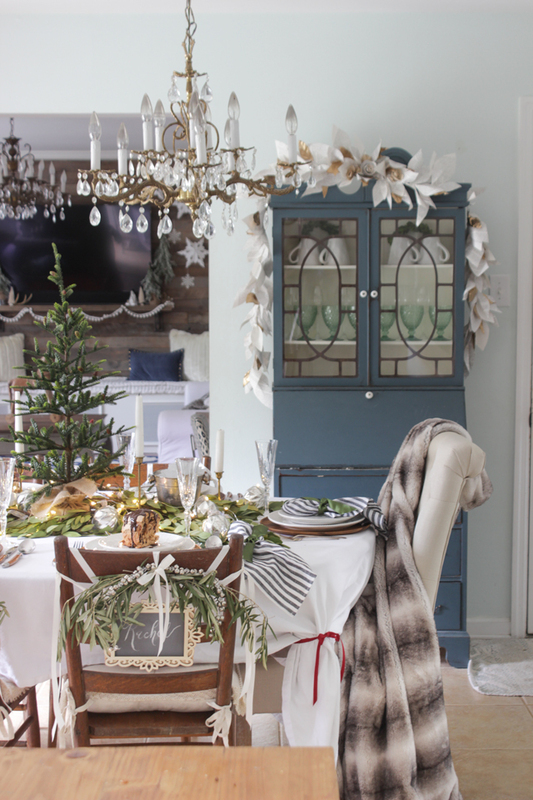 Can’t wait to see your holiday home tour….I’m always in awe of your decor!!! I really love your dining room. It is really pretty , great idea using lights on the table. I am so doing this. Also was wondering if you painted the blue secretary? I have a cheapie one that I would love to do this to. Also are the door panels black? I would live the wholesale rs web page or # also thank you. They don’t ship or do stuff online– just check your local yellow pages– wholesalers are in every big city. 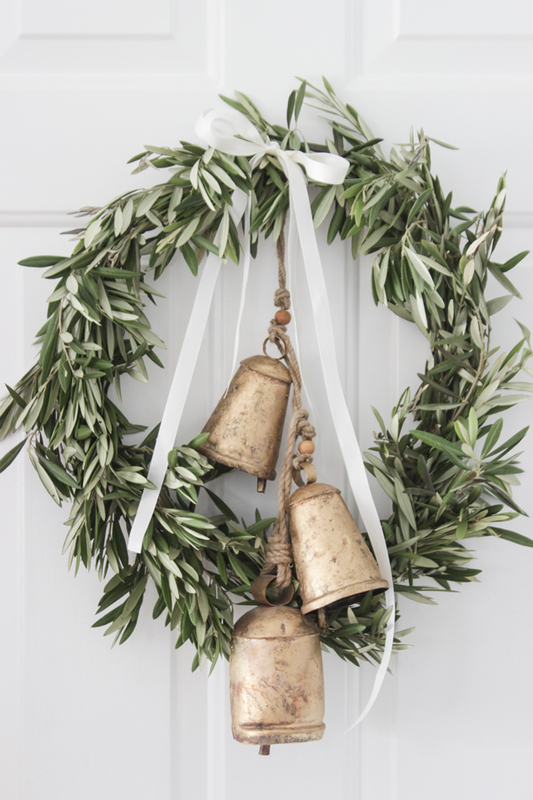 Love the olive wreath…where can I find branches to make one myself? Thanks! Any florist should be able to either order some or buy them through their wholesaler and then sell to you. Mistyped my email – corrected it in case you need it. Thanks! Your table setting is fabulous. It looks so warm and welcoming. I love everything you did in this room.